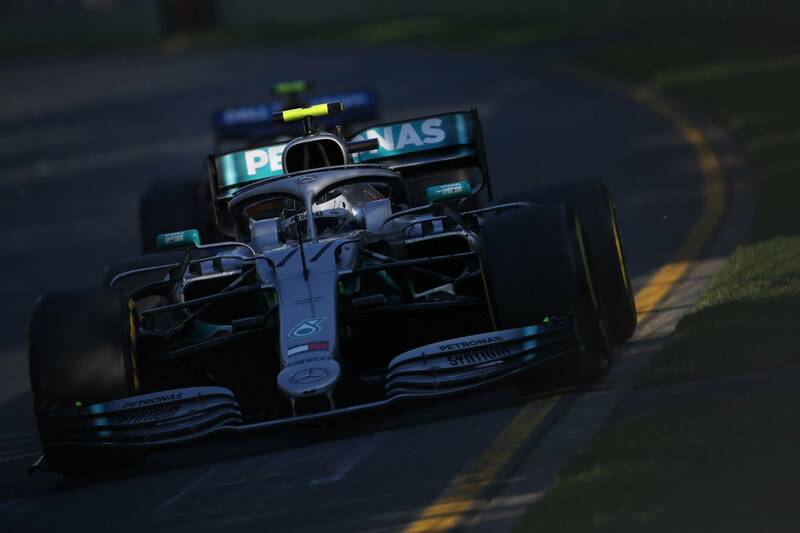 His three previous wins were edge-of-your-seat thrillers - but Valtteri Bottas tore up the form book to crush the field in Australia on Sunday. It may only have been the fourth of his Formula 1 career, yet Valtteri Bottas’ victory in Sunday’s Australian Grand Prix carried a great deal of significance. Coming back from a winless 2018 with such an emphatic response to all of the criticism laid against him was the obvious narrative in the aftermath of the race (Bottas even sent a personal message to “whom it may concern”…) as the Finn snapped his drought dating back to Abu Dhabi 2017. But even without that subtext, the fashion of Bottas’ victory was nothing short of sensational. His three previous F1 wins – taken in Russia, Austria, and Abu Dhabi in 2017 – all followed a similar story: soaking up pressure throughout the race, remaining ice cool under pressure and holding on for victory. The winning margins of 0.617s, 0.658s and 3.899s at those respective races tell the story themselves. So to deliver a beatdown as he did on Sunday in Melbourne, where he finished over 20 seconds clear of the field in a race where he was far from being the favourite, was an enormous achievement. Bottas said himself after the race he thought it was his best race ever, and it is hard to disagree. What made Bottas’ win so good was how effortless it all seemed. At no point was there ever any real danger of him losing the race. His buffer was such in the closing stages that he even asked Mercedes’ pit wall if a second pit stop was being considered – he could have taken it – as he ran largely alone at the front. A perfect start as teammate Lewis Hamilton got some wheelspin on pole allowed Bottas to float up the inside on the run to Turn 1 and seize the lead. If Hamilton wanted his third Australian Grand Prix victory, he was going to have to fight for it. But Hamilton was powerless to keep up with Bottas in the early stages of the race. The leader was already out of DRS range by the time it came into action, and in fact set a faster time on each of the first 10 laps of the race. By the time Hamilton had cut the gap for the first time, Bottas was already 3.5 seconds up the road. The gap soon stabilised, leaving Hamilton still within spitting distance. But his hopes of winning the race effectively ended when Mercedes brought the reigning world champion into the pits at the end of Lap 15 in order to see off the undercut from Sebastian Vettel in P3. Vettel had been lurking around three seconds back from Hamilton, and given the rapid track improvements seen in qualifying, overhauling that gap on fresh tyres was a real concern. Mercedes managed to see off Vettel with little stress, but was not yet ready to also bring in Bottas, instead keeping him on the original strategy. Pirelli’s decision to go for harder tyre selections in 2019 not only means that one-stop races are far more likely, but it also means there is a bigger window for coming into the pits. There was no immediate need for Bottas to respond, so long as his lap times held up. And hold up they did. Bottas managed to set a new personal best lap time on four consecutive laps soon after Hamilton’s pit stop, running beyond Mercedes’ initial strategy length before eventually diving into the pits on Lap 23. The damage had been done to Hamilton’s race through this stint. Even with fresher tyres, he had struggled to match Bottas’ pace, with Mercedes revealing after the race that the Briton’s car had sustained some floor damage that may go some way to explaining his struggles. By the time Bottas was back out on-track, the gap between the pair that was less than four seconds prior to their pit stops had swelled to more than 10 seconds. The only driver running a similar strategy to Bottas was Max Verstappen, who took a brief turn in the lead before coming in on Lap 25. He wasted little time in showing just how good the fresh tyres were as he waltzed past Vettel and then proceeded to pile pressure on Hamilton for second place, carving five seconds out of the Mercedes in the space of eight laps. Hamilton remained in control in the fight for P2, but as each lapped ticked down, Bottas moved increasingly out of sight at the front. 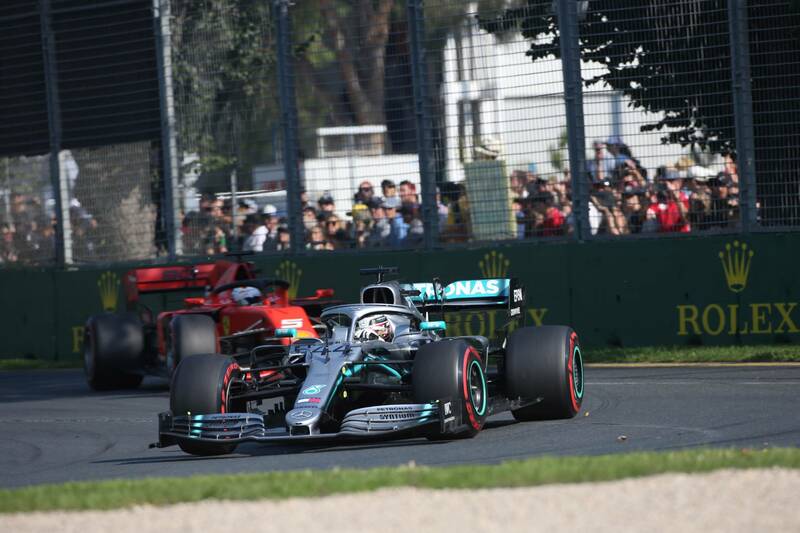 A late flurry of quick lap times in a bid to get the fastest lap bonus point skewed some of the gaps a bit, with Hamilton taking five seconds out of Bottas in the final seven laps to cut his victory margin to only 20 seconds. To put that in perspective: only one other race in the past two seasons has been won by more than 20 seconds (Hamilton’s Spanish Grand Prix victory last year); only seven have been since the start of the V6 hybrid era in 2014. “It just felt amazing today, but I can’t say for what particular reason,” Bottas said. “If you look at statistics from the past, this has never been my best race. In terms of race pace, in the past, it hadn’t been too bad, but qualifying had been a bit tricky, so I’d never had a clean race here. “You are aware when you’ve been better and where it has been more difficult, but you try to neutral on that, be mentally empty for the weekend and not think about it. Bottas and Verstappen were not the only drivers to benefit from running long first stints in Australia as a number of midfield runners were able to capitalise on the premature calls from their rivals. The tight and twisting nature of the Albert Park circuit has made it notoriously difficult to overtake at, with track position being king. And so it proved to be once again today. The fight to top the midfield was a close one in the early stages, with Kevin Magnussen leading a train of cars including Haas teammate Romain Grosjean, Renault’s Nico Hulkenberg, Alfa Romeo’s Kimi Raikkonen, McLaren’s Lando Norris and the Toro Rosso of Alexander Albon. All six drivers pitted fairly early – Grosjean would ultimately retire due to an issue fitting the front-left tyre to his car – and came out in traffic. Raikkonen’s Alfa Romeo teammate, Antonio Giovinazzi, was the cork in the bottle, holding the drivers back as he tried to make a long first stint work. Magnussen boldly passed after dummying a divebomb at Turn 13, with Hulkenberg and Raikkonen soon following suit, but Norris struggled to make it through. The McLaren driver toiled for seven laps trying to pass the Italian before eventually making it through, by which time the other midfield runners had already run far up the road. The gap Giovinazzi had helped create opened the door for Lance Stroll and Daniil Kvyat to both sneak up into the points, getting the jump after a long first stint. Kvyat did well to edge ahead of Red Bull’s Pierre Gasly using his warmed-up tyres at pit exit before holding the Frenchman back for the final 20 laps – 15 of which he had DRS for – to clinch a comeback point for Toro Rosso. 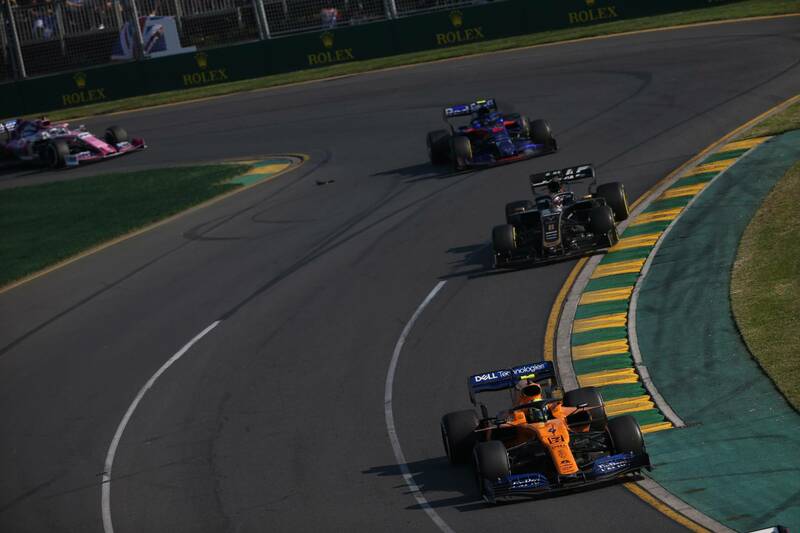 We may not have seen a litany of overtakes in Australia on Sunday, but as is always the case at Albert Park, track position and strategy proved to be the two bigger deciding factors.